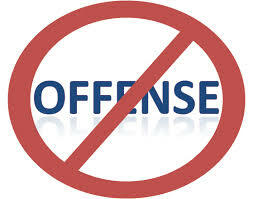 According to a recent poll taken of teen girls, catty office workers, and relatives with high expectations of you, beginning a critical statement with “no offense” actually doesn’t get you off the hook. In fact, 72% of users say the words trigger immediate offensiveness. We talked to Rick, long time office chatter box who has shown up hungover twice a month for 11 years straight now. “All this time I had been saying “no offense.. but your breath smells” “no offense.. but your teeth are yellow” “..your feet smell horrible”. And I thought I was getting away scott free without them getting offended, turns out my world was upside down” After speaking with Rick and his buddy Scott at the office, Rick will be taking a much closer look at who he decides to offend. What’s next, guys seriously answering to “how’s it goin” when crossing paths in the bathroom? Reblogged this on Wise News.